As Gone With the Wind— the book by Margaret Mitchell– celebrates it’s 80th Anniversary, having been released in 1936, celebrations have taken place all over the country and St. Louis is adding its name to the mix. Gateway to the Wind 2.0, Sept. 24, 2016, will be a day-long event which hopes to be fun, educational, and interesting to anyone who likes Gone With the Wind or just has an interest in “what’s the big deal with a movie that is still this popular years later.” Ten years ago, St. Louis was host to the original Gateway to the Wind event which was a three -day event. The “Gateway” part references St. Louis and the Arch as being the Gateway to the West and interestingly enough there are several Gone With the Wind ties in St. Louis, which will be highlighted at the event. When the St. Louis County Public Library’s Grant’s View Branch approached author Sally Tippett Rains about doing a talk on her book The Making of a Masterpiece, the True Story of Margaret Mitchell’s Book Gone With the Wind she suggested making a day of it. Last year at a talk about her book, she enlisted the help of Nikki Luebke, who brought some replica dresses, and GWTW Collectors Anna Blair and Rita Kiry Ryan who brought items from their collection. The event, held on a Tuesday afternoon at the Library was so much fun they are expanding it this year– to a an all-day event on a Saturday. Greg Giese, a resident from the Greater St. Louis Area who splits his time between Los Angeles and Belleville, Illinois played two babies in the movie and he will be on hand to discuss the movie. But what he does have is a picture of him as an infant with the social security card his parents were forced to get him at an early age so he could participate in the movie. He has pictures with Olivia de Havilland and memories of reunions with the other cast members. Giese, shown in picture, left, will be on hand along with Rains to talk about the famous book-turned-movie. Giese and his on-screen mother Olivia de Havilland are among the only ones still living from the film. Olivia de Havilland turned 100 in July of 2016. Sally Rains and Greg Giese have spoken at other Gone With the Wind events around the country and Giese is featured in Rains’ book. The St. Louis event will be a coming together of those who have an interest in the book and movie. There are many GWTW Collectors around the country, all who share the common bond of being interested in some aspect of the famous book and movie. There will be a trivia game, drawings and prizes. The entire event is free and open to the public. Nikki Luebke will have her replica dresses. They are all full-sized and will be displayed on mannequins. The picture, below shows last year’s display along with the speakers. From left to right, Rita Kiry Ryan, Nikki Luebke, Anna Blair, and Sally Tippett Rains. Nikki Luebke has signed sketches from Gone With the Wind Costume Designer Walter Plunkett which she will display and talk about. Rita Kiry Ryan has been collecting for 40 years and her collection includes various items including Franklin Mint Dolls, plates, and unique promotional memorabilia sold in connection with the 1939 opening of the film. She will give a talk about “The Art of Collecting” about her collection and Gone With the Wind collectibles. She will also talk about her items and about the famous Atlanta Premiere which made headlines around the country. This event (which will be held at the new Grant’s View Library, as the Tesson Ferry Branch has closed since the last presentation) will focus directly on the book written by Mitchell, a Southern woman from Atlanta, Georgia, whose perspective came from having a family involved directly in the Civil War. It was in the 1920’s that she started the book — just 30 years after the Civil War was over– and she wrote about what she knew about from family conversations and scrapbooks– and real people who were there. Shortly after the book came out Hollywood came calling, and 80 years later it is still one of the most popular topics of Jeopardy questions and crossword puzzles. Rains was able to get her hands on a Mitchell family scrapbook– their real-life scrapbook– which has many similar events in it as events that took place in Gone With the Wind. Shown above, Marie Nygren, a cousin of Margaret Mitchell, who owns the scrapbook, shows it off. After looking at the scrapbook, it was easy to see that Margaret Mitchell wrote the book directly from events and people in her life, and she used her imagination and talents as a writer to enhance it. Nygren gave Rains permission to view the scrapbook, and a copy of it will be on display at the event. There will be several tables of GWTW memorabilia on display. 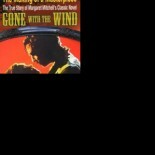 Celebrate Gone With the Wind’s 80th Anniversary! Saturday, September 24, 10:00 – 4:00 p.m. Meeting Rooms 1 & 2. 10:30 a.m. Replica Costumes: Learn about costume designer Walter Plunkett and view Nikki Luebke’s collection featuring signed design sketches by Plunkett and replica costumes worn by Scarlett O’Hara. 11:00 a.m. “The Making of a Masterpiece, The True Story of Gone With the Wind– and the many St. Louis Connections to the Book” Q&A by St. Louis author Sally Tippett Rains, and Greg Giese, St. Louis Area native who played two babies in the movie. 2:00 p.m. Gone With the Wind Collectors: Learn more about GWTW with the collections of Anna Blair and Rita Kiry Ryan. *There may be more added or changed around, so stay tuned. WHERE IS GRANT’S VIEW LIBRARY? The street address is: 9700 Musick Ave, St. Louis, MO 63123, but is is on the corner of Gravois and Musick, just across the street from Grant’s Farm. Drury Inn & Suites St. Louis Southwest is located in St. Louis County (near Fenton) at the junction of I-44 and Highway 141. Directions from this hotel to the Grant’s View Library- Take 141 to left on Gravois (highway 30), and then turn right at Musick to enter the parking lot. The Library is about 10 minutes from the hotel. Any questions about the events? Contact Sally Rains at SallyRains314@gmail.com. All events are open to the public. Hopefully we won’t have such a big crowd that they would restrict how many can come, but if you get there at the beginning it should be no problem at all. It is all in the same library, the Grant’s View Library on Gravois. We were just making reference to the Tesson Ferry Library as it is closed and that is where we had a GWTW event last year. Please email me at SallyRains314@gmail.com if you have any questions, I’d love to know where you would be coming in from and if you have a collection yourself. Thanks for reading the article and commenting. This entry was posted on July 30, 2016 by gwtwbook in Uncategorized.